I posted a picture on my instagram the other day from a trip I took to Santa Marta last year. The sunsets on this side of the Caribbean are golden with pangs of orange, just begging to be photographed. 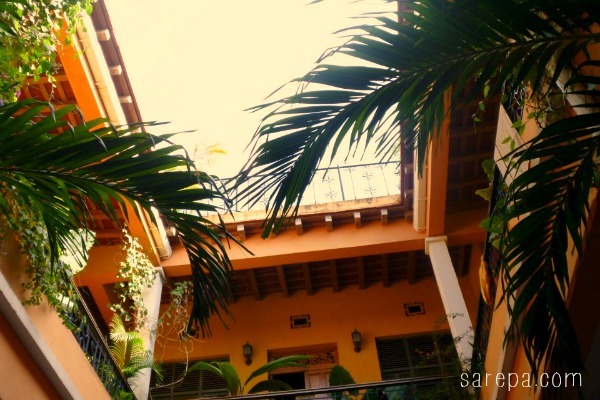 I had visited Santa Marta before, and while it doesn’t have beautiful architecture of Cartagena or the well-known must-see tourist locations, it does have a lot going for it in terms of what is accessible from the centre of town. It really doesn’t matter if you want a chilled out weekend in a hammock, a beach getaway, a hike through the Colombian jungle or a history lesson about Colombia’s past, it is all in Santa Marta, or close by. 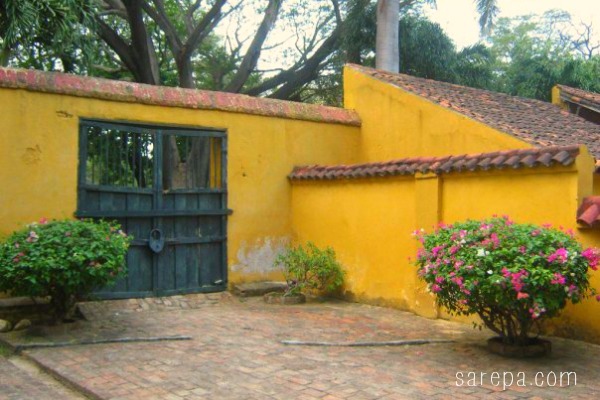 Here are some of my favourite things to do while in Santa Marta. While there are great restaurants and great things to see and do in Santa Marta itself, it is at the centre of the region and is close to places like Tayrona, Taganga, The Lost City and Los Piños. What I did was stay in a hostel in Santa Marta and then planned day trips or overnight trips to some of the surrounding areas. Cuisine on the coast is delicious and you must try freshly-caught fish with coconut rice and plantain. I could eat this every day. 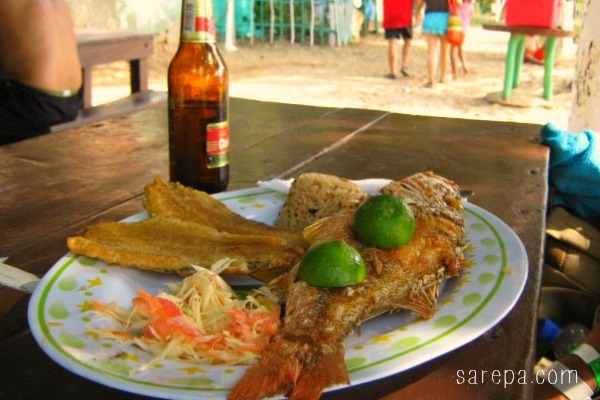 I tried this dish while visiting Playa Cristal which is just outside of Santa Marta in Tayrona. 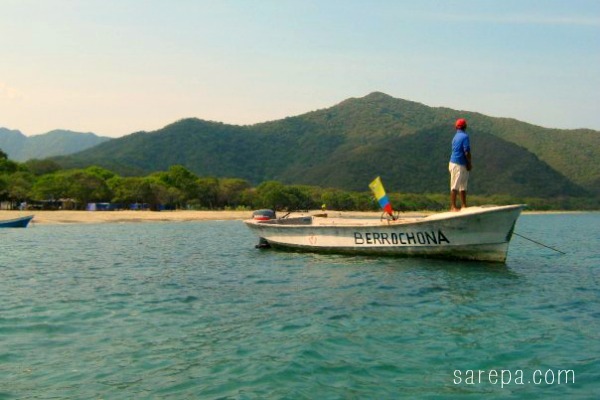 While the beach in the centre of Santa Marta is busy and can be crowded, I visited once in Christmas and it was hectic, there are a bunch of beaches you can visit for the day or a few including in Tayrona National Park. I went on a great tour back in 2009 which took us around Santa Marta by bus, visiting some very interesting historical places. As well as spotting Carlos Vives’ uncle, we also visited Quinta de San Pedro Alejandrino, a museum which was once Simon Bolivar’s home and is where el Liberador died. This is a great place to learn about the history of Colombia and it’s liberator Simon Bolivar. I’ve written about the Ciudad Perdida (The Lost City) before, and it’s because I can’t recommend this trek enough. If you get bored of the beach and was to find a bit of adventure, then I definitely suggest this trek. Read more about it here. So, if you’re planning a visit to Colombia, I’d definitely suggest you keep Santa Marta on your radar. One of my fave places. What’s your favourite place to visit in Colombia? Sarepa, I am a fan of your travel advices! You know Colombia better than I do. I am looking forward to return and explore some of the places you suggest. And wow, what a sun set! Thanks so much, Casa Carolina. I think it really is a must while in Santa Marta. So much history!